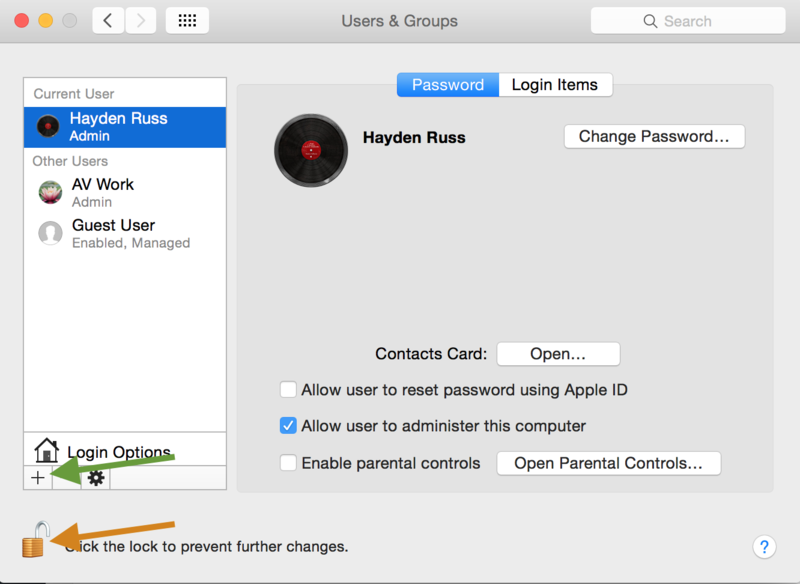 Welcome to our step by step guide for How to Setup Your Mac Like an AV Professional. Whether you’re using PowerPoint, Keynote, Playback Pro, Q-lab, VJ software or any other similar software this guide will help build a more safe and robust system for your next presentation. This may also benefit designers and video editors, of course some settings might need to be changed due to the situation or personal preferences, however this is a good starting point to get maximum performance. Whether you’re using your own Mac or hiring from us, we recommend creating a brand new user profile if you plan to use this for anything beyond usual work/personal purposes. For example I have my standard user profile that I use for emails, design etc and then I have another called AV Work. Here are a few reasons why its a good idea to create a new profile. 1. It sets a base configuration without any background processes running that will clog up system resources. 2. It helps with file management as you can delete the profile afterwards, which will delete any sensitive data. 3. Its a good way to ensure you don’t have any programs running that may cause interruptions or embarrassing situations like email alerts, message chimes or notification popups. 4. If you have staff or clients using the presentation machine sensitive information from other profiles will be kept private. 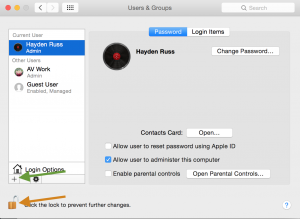 To create a new profile it’s super easy, go to system preferences ===> Users and Groups ===> Add a new user account. You may have to click on the security lock to allow access and enter the password. As mentioned above we are covering off a typical audiovisual setup for PowerPoint, Keynote, Playback Pro and VJ work. Some of these settings might not apply. I.e. Screen saver, background image and a few other settings might not change or can be set to personal preferences. – Untick : Displays have separate Spaces. This can be left or set to your personal preference. I usually add any local language settings you might require. In my case I usually add arabic. This will be largely based on your external display settings if connected. We never recommend running a show on battery power, so the only setting I change here is to tick Slightly dim the display while on battery. This is a good safety measure as you might see the screen dim which means you have lost power. Set these to your personal preferences. – It’s important to ensure that when you connect a 3.5mm jack/aux cable, HDMI cable, external sound card, or DI that you set your output to the correct output. Mac OSX doesn’t always default back to the last setting so anytime you plug in any of the above cables check what your output device is set to. As far as settings go that’s all you need to change for the profile. Audiovisual technicians. We also suggest installing an application called TestCards from the App Store. It has a number of different test patterns that will help you during setup. We hope this helps you set a robust profile for you next live presentation. Need a quote for equipment? Need it in a hurry? Then let's talk. Simply visit our inquiry page & we’ll be in touch shortly!